This user research article is based on the publication “Nierhaus T, Gundlach C, Goltz D, Thiel SD, Pleger B, Villringer A (2013) Internal ventilation system of MR scanners induces specific EEG artifact during simultaneous EEG-fMRI. Neuroimage 74:70-6”. The most prominent MR-related EEG artifacts are gradient artifacts (due to the rapidly alternating magnetic fields of the MR scanner) and the ballistocardiogram (induced by cardiac-related body and electrode movements in the static magnetic field B0). Several data processing methods have been developed that can be used for offline or online correction (Allen et al., 1998; Allen et al., 2000; Debener et al., 2007; Grouiller et al., 2007; Kim et al., 2004; Liu et al., 2012; de Munck et al., 2012, Niazy et al., 2005; Ritter et al., 2007). However, vibrations represent another problematic source of artifacts. Any movement of the EEG equipment in the static magnetic field of the MR scanner inevitably induces noise voltage. Data correction for such vibration related artifacts, however, is still an unsolved problem. Template subtraction is often not applicable because in many MR systems the vibration related artifacts do not have a characteristic temporal shape. And since all electrodes are similarly affected, correction algorithms using spatial filters (e.g. ICA) are not feasible. Therefore, noise assessment and reduction is of special importance for EEG measurements within the MR scanner. There are various sources of vibration: scanner noise, building vibration, impact noise, or vibrating elements in the experimental setup. For example, headphones used in experiments involving auditory stimulation are usually equipped with piezo elements that generate sounds by driving a membrane. Sound related vibrations can then be transmitted to the EEG cap and thus induce artifacts. In this article, we draw attention to elements in the MR-scanner that act as a main source of vibration. We show that the helium pump and the internal ventilation system of MR scanners induce two systematic artifacts in the EEG signal which appear to be in the range of physiologically relevant brain rhythms. With the helium pump artifact, it is already common practice to switch off the pump for simultaneous EEG/fMRI measurements (Assecondi et al., 2010; Bagshaw and Bénar, 2010; Bonmassar et al., 2002; Correa et al., 2010; Leicht et al., 2010; Ritter et al., 2010; Sammer et al., 2007, Wan et al., 2006). However, the ventilation artifact had not yet been described in the literature and is therefore systematically investigated here. Measurements were taken using a 3-T SIEMENS Magnetom scanner (Verio, Siemens, Erlangen, Germany). EEG recordings were acquired using an MRI-compatible EEG system (recorder settings: amplifier resolution = 0.5 μV, sampling frequency = 5,000 Hz, lowpass filter = 250 Hz) consisting of an MRI-compatible amplifier (Brain Products, Munich, Germany) and a 32-channel EEG cap (Easy cap, Falk Minow Services, Herrsching-Breitbrunn, Germany) with 31 scalp channels and one electrocardiogram channel (reference located at position FCz). Impedances of all electrodes were kept below 5kΩ. The EEG acquisition was synchronized to the gradient-switching clock of the MR-scanner using the Syncbox device (Brain Products, Munich, Germany). A standard T2*-weighted echo-planar imaging (EPI) sequence (TR = 2000 ms) was used to induce the gradient switching artifacts in the EEG. Thirty slices were acquired in an interleaved mode. The scanning planes were oriented according to the AC–PC convention. In one run, 60 volumes were acquired. Nine EEG measurements (1–2 minutes each) were taken with the subject at rest and the amplifier located inside the scanner bore. This represents the default setup for EEG-fMRI experiments; the cable connecting the subject’s EEG cap with the amplifier is kept as short as possible because it is prone to electromagnetic and vibration related artifacts. Different settings of helium pump, ventilation and EPI-scan were combined in order to systematically investigate artifacts caused by the scanner environment. Moreover, we acquired three additional EEG recordings with the ventilator running on level 2 and the amplifier and/or subject placed outside (i.e. behind) the scanner tube on a chair. 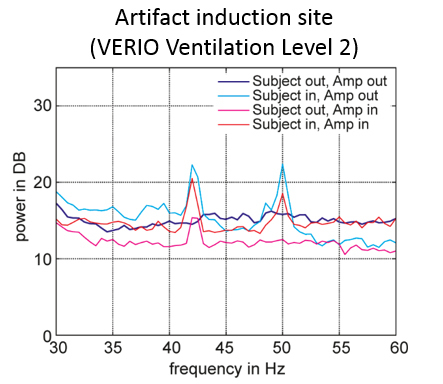 The aim was to find the ventilation artifact’s main induction site (EEG cap or amplifier). EEG data was analysed offline using Matlab (The Mathworks Inc., Natick, USA). EEG recordings acquired during MRI scanning were first corrected for gradient artifacts using a self-built template-based subtraction method. All EEG measurements were corrected for ballistocardiogram artifacts using the EEGLab (Delorme & Makeig, 2004) implemented BCG-correction routine (EEGLab, PCA/OBS approach) and were downsampled to 500 Hz. For further analysis, the first five seconds of each measurement were discarded and the following epoch of 50 seconds was selected for spectral analysis. Power spectral density was calculated for each channel (31 scalp electrodes) using the fast Fourier transform (FFT) implemented in the Matlab PSD command with a frequency resolution of 0.5 Hz. Scalp topographies of the artifact peaks were generated using the Matlab topoplot command. Since we found no differences in artifact frequency between electrodes, the EEG results are presented by averaging the power spectra of all 31 scalp electrodes. A windowed FFT (window size = 10 s, no overlap) was applied to provide a temporal characterization of the artifact peak power with mean and standard deviation. 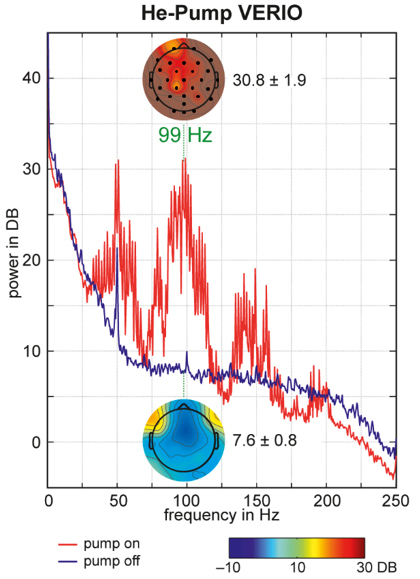 The helium pump of the VERIO scanner induced artifacts in the frequency spectrum of the EEG with additional broad band frequency power starting from 30 Hz (Fig. 1, red line). Switching off the pump eliminated the artifact, leaving only 50 Hz peaks of the line voltage and its higher harmonics (Fig. 1, blue line). Scalp topographies show no differences in the artifact frequency between electrodes, but there was a modulation due to the position of the reference electrode (FCz). The time resolved FFT revealed a peak power fluctuation of about 6%. The scanner’s internal ventilation system induced a specific peak and its higher harmonic in the frequency spectrum of the EEG data. Dependent on the ventilation level, this frequency peak was found at ~37 Hz, ~41 Hz, and ~50 Hz for ventilation levels 1, 2, and 3, respectively (Fig. 2, left). The fMRI settings with 30 slices, acquired within a TR of 2 seconds, induced a gradient artifact with an initial peak at 15 Hz in the EEG power spectrum, followed by its higher harmonics. The gradient artifact correction sufficiently eliminated the initial 15 Hz peak, leaving only residuals of the higher harmonics (Fig. 2, right). 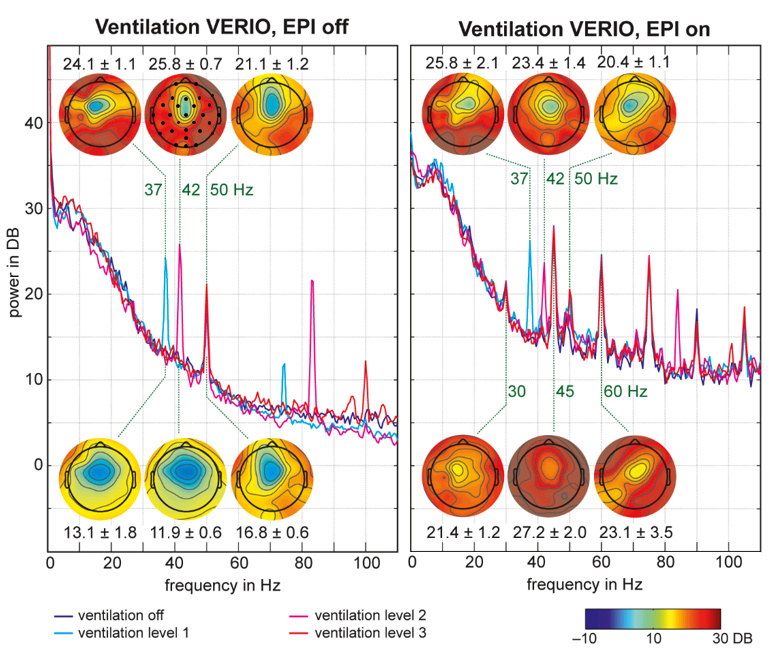 Additionally, the frequency peaks of the ventilation artifact (at ~37 Hz, ~41 Hz, and ~50 Hz for levels 1, 2, and 3, respectively) were clearly visible with an amplitude similar to (or even greater than) the residuals of the gradient artifact. Scalp topographies indicated no differences between electrodes with respect to the contamination by the artifacts, but did show a modulation by the position of the reference electrode (FCz). The time resolved FFT revealed small fluctuations in peak power over time which were slightly increased during the EPI measurement. Similar to the helium pump artifact, switching off the ventilation eliminated all associated artifacts completely (Fig. 2, dark blue lines). Fig. 3 shows the VERIO ventilation artifact (level 2) for different scenarios of the subject and the amplifier being located inside or outside the scanner. The artifact was maximum when the subject was located inside the tube on the patient table (Fig. 3, red and cyan lines) and it disappeared when the subject and the amplifier were located outside the bore, behind the scanner (Fig. 3, blue line). The amplifier alone in the scanner tube (not on the table) was less affected by the ventilation (Fig. 3, magenta line). Additionally, the 50 Hz line noise peak appeared only when the subject was inside the scanner tube. Our results show that the scanner’s helium pump and internal ventilation system cause vibrations of the scanner tube’s internal coverage, interfering with EEG recordings and inducing frequency peaks in the power spectrum of the EEG. These frequency peaks are in a physiologically relevant frequency range, and thus represent a crucial problem for neurophysiological studies. The ventilation dependent artifact was most prominent on the electrodes placed directly on the subject’s head, so it is not sufficient to simply place the EEG’s amplifier outside the scanner tube. Instead, both, the helium pump and the ventilation must be switched off during acquisition to fully eliminate the artificial manipulation of EEG recordings. Nevertheless, each EEG-fMRI user should assess the MR scanner specific noise characteristic, especially where switching off the He pump is not possible. Depending on the scanner environment, it could be possible that frequency ranges of interest are not affected or noise characteristics show repetitive patterns so that post-hoc corrections can be made. Allen, P. J., Josephs, O., Turner, R. (2000). A Method for Removing Imaging Artifact from Continuous EEG Recorded during Functional MRI. NeuroImage, 12(2), 230-239. Allen, P. J., Polizzi, G., Krakow, K., Fish, D. R., Lemieux, L. (1998). Identification of EEG Events in the MR Scanner: The Problem of Pulse Artifact and a Method for Its Subtraction. NeuroImage, 8(3), 229-239. Assecondi, S., Vanderperren, K., Novitskiy, N., Ramautar, J.R., Fias, W., Staelens, S., Stiers, P., Sunaert, S., Van Huffel, S., Lemahieu, I. (2010). Effect of the static magnetic field of the MR-scanner on ERPs: Evaluation of visual, cognitive and motor potentials. Clinical Neurophysiology 121, 672-685. Bagshaw, A.P., Bénar, C.-G. (2010). Scanning Strategies for Simultaneous EEG-fMRI Recordings, in: Ullsperger, M., Debener, S. (Eds. ), Simultaneous EEG and fMRI: recording, analysis and application. Oxford University Press, USA. Bonmassar, G., Purdon, P.L., Jääskeläinen, I.P., Chiappa, K., Solo, V., Brown, E.N., Belliveau, J.W. (2002). Motion and Ballistocardiogram Artifact Removal for Interleaved Recording of EEG and EPs during MRI. NeuroImage 16, 1127-1141. Correa, N.M., Eichele, T., Adalı, T., Li, Y.-O., Calhoun, V.D. (2010). Multi-set canonical correlation analysis for the fusion of concurrent single trial ERP and functional MRI. NeuroImage 50, 1438-1445. Debener, S., Strobel, A., Sorger, B., Peters, J., Kranczioch, C., Engel, A.K., Goebel, R. (2007). Improved quality of auditory event-related potentials recorded simultaneously with 3-T fMRI: Removal of the ballistocardiogram artefact. NeuroImage, 34(2), 587-597. Grouiller, F., Vercueil, L., Krainik, A., Segebarth, C., Kahane, P., David, O. (2007). A comparative study of different artefact removal algorithms for EEG signals acquired during functional MRI. NeuroImage, 38(1), 124-137. Kim, K. H., Yoon, H. W., Park, H. W. (2004). Improved ballistocardiac artifact removal from the electroencephalogram recorded in fMRI. Journal of Neuroscience Methods, 135(1–2), 193-203. Leicht, G., Herrmann, C., Mulert, C. (2010). BOLD Response and EEG Gamma Oscillations, in: Mulert, C., Lemieux, L. (Eds. ), EEG – fMRI. Springer Berlin Heidelberg, pp. 465-483. Liu, Z., de Zwart, J. A., van Gelderen, P., Kuo, L.-W., Duyn, J. H. (2012). Statistical feature extraction for artifact removal from concurrent fMRI-EEG recordings. NeuroImage, 59(3), 2073-2087.
 de Munck, J.C., van Houdt, P.J., Gonçalves, S.I., van Wegen, E., Ossenblok, P.P., 2012. Novel artefact removal algorithms for co-registered EEG/fMRI based on selective averaging and subtraction. NeuroImage, 64, 407-15. Niazy, R. K., Beckmann, C. F., Iannetti, G. D., Brady, J. M., Smith, S. M. (2005). Removal of FMRI environment artifacts from EEG data using optimal basis sets. NeuroImage, 28(3), 720-737. Ritter, P., Becker, R., Freyer, F., Villringer, A. (2010). EEG Quality: The Image Acquisition Artefact. In C. Mulert, L. Lemieux (Eds. ), EEG – fMRI (pp. 153-171): Springer Berlin Heidelberg. Ritter, P., Becker, R., Graefe, C., Villringer, A., 2007. Evaluating gradient artifact correction of EEG data acquired simultaneously with fMRI. Magnetic resonance imaging, 25, 923–932. Sammer, G., Blecker, C., Gebhardt, H., Bischoff, M., Stark, R., Morgen, K., Vaitl, D. (2007). Relationship between regional hemodynamic activity and simultaneously recorded EEG-theta associated with mental arithmetic-induced workload. Human Brain Mapping 28, 793-803. Wan, X., Iwata, K., Riera, J., Ozaki, T., Kitamura, M., Kawashima, R. (2006). Artifact reduction for EEG/fMRI recording: Nonlinear reduction of ballistocardiogram artifacts. Clinical Neurophysiology 117, 668-680.